So, what did you do this weekend? Maybe you are one of those people that is drained by the time the weekend rolls around, and you spend your Saturdays and Sundays relaxing and recharging batteries. Or maybe, just maybe, your the type that uses your weekends to get a serious work in on side projects, whether those be personal or professional. 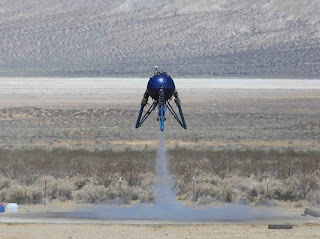 The two Paul Breeds--the father and son team also known as Unreasonable Rocket--performed their first untethered test of their Northrop Grumman Lunar Lander Challenge entry at the Friends of Amateur Rocketry site not too far from Mojave, CA. More info is sure to follow soon on their blog. Google Lunar X PRIZE team Omega Envoy is testing a prototype of their lunar rover on Devon Island, high in the Arctic Circle. 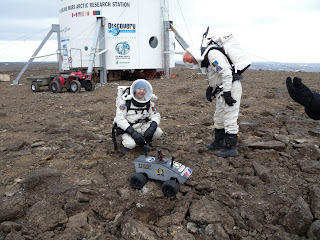 Devon Island has long been home to some special Mars analog sites--the Haughton-Mars Project and Flashline Mars Arctic Research Station, but the extreme environments and the remote location also make it a great proving ground for lunar robotics. You can read more about Omega Envoy's testing program on their blog. To be honest, I cheated a bit on this one--I used an old picture to represent some new developments. The three gentlemen above are members of Google Lunar X PRIZE team FREDNET, the first of our teams to go the Open Source route. 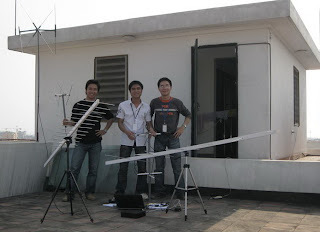 These three are part of a group in Viet Nam that is working on a Nanosat, a very small satellite. This past weekend, they posted a quick update on the design progress for their spacecraft, which will space qualify several of the components (especially avionics) that will eventually be used on FREDNET's lunar mission. What's a good way to follow up a weekend full of space-related activities? How about day with a pretty decent chance of a Space Shuttle and a Space X Falcon 1 launch going off within an hour so of each other? It is, clearly, and awfully good time to be a space enthusiast!